This week’s projections are well in advance due to the FA Cup fourth round taking place over the weekend and pushing the next round of Premier League games to Tuesday 29th and Wednesday 30th January. FPL managers will be studying the cup games closely, with progressions, eliminations, and Monday’s fifth round draw playing huge factors in how the Fantasy season will pan out. Looking back, Gameweek 23 was dominated by Man Utd assets, Man City assets and the irrepressible Mohamed Salah (£13.6m). While Lucas Digne (£5.3m) and Fernando Llorente (£5.6m) rewarded new owners with goals – but at the wrong end – Newcastle’s Fabian Schär (£4.6m) showed he was ‘Strong Enough’ to waltz through the Cardiff defence and score a remarkable brace that helped deliver a 21-point haul for his 0.3% ownership. The centre-back narrowly pipped Diogo Jota (£5.9m) to become the week’s top scorer, as Wolves’ forward scored a hat-trick in one of the weekend’s two 4-3 thrillers. SCOUT: Diogo Jota (£5.9m) claimed his first #PL hat-trick to earn 19pts. The second took place at Anfield, where Crystal Palace almost replicated their shock 3-2 win over Man City. Liverpool had only conceded three at home all season, until Palace matched this in one bizarre afternoon. They ultimately overcame the challenge with strikes from Roberto Firmino (£9.3m), Sadio Mane (£9.5m) and two from Salah. In other news, James Milner (£5.6m) was sent off by his old primary school PE teacher Jon Moss. Jon Moss was James Milners PE teacher at school in Leeds. 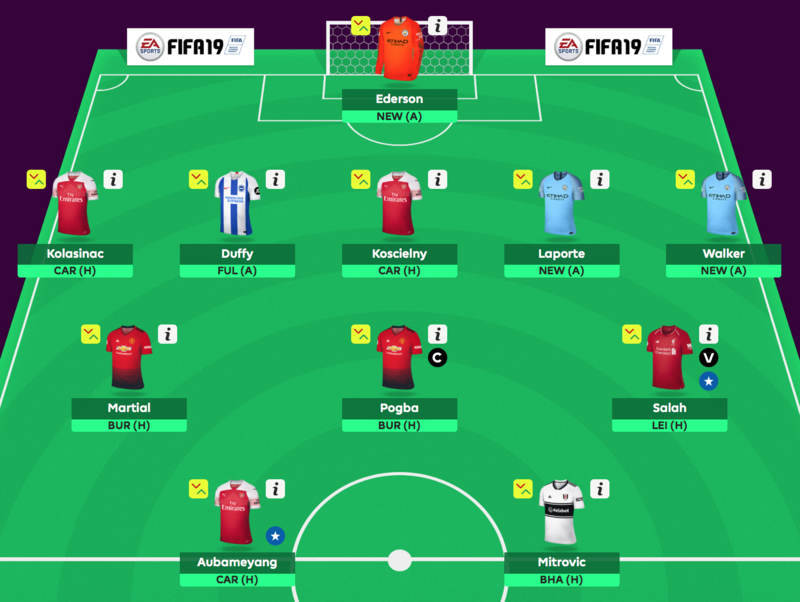 Last week’s line-up scored well below what was expected, with a score of 47 heavily-boosted by the midfield trio of Salah, Paul Pogba (£8.7m) and Raheem Sterling (£11.3m). They brought home 33 points. Doubling-up on Leicester’s defence returned -1 points because Harry Maguire (£5.4m) and Ricardo Pereira (£5.3m) let in four goals. Llorente’s unfortunate error meant the Spurs defensive trio of Danny Rose (£5.8m), Jan Vertonghen (£5.9m) and Kieran Trippier (£6.1m) also conceded. 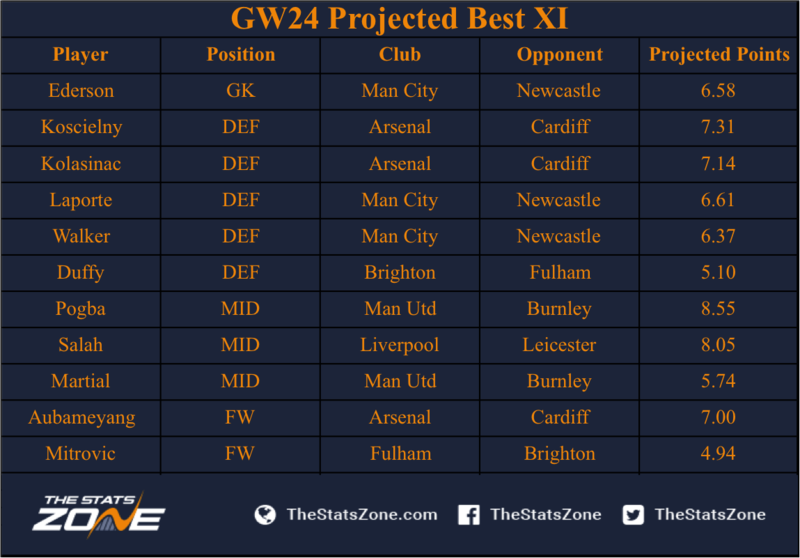 Gameweek 24 has no clashes between the ‘big six’ and presents promising games for attacking assets of Arsenal (vs Cardiff), Man United (vs Burnley) and Liverpool (vs Leicester). Of these, only the Gunners have defensive representatives, due to Man United’s chronic defensive issues and Leicester’s complete unpredictability. They have shown that they can topple Chelsea and Man City, but the same team can lose at home to Cardiff and Southampton, and 4-3 at Wolves. It’s not like Arsenal are defensive stalwarts either – their four clean sheets are only bettered (or worsened) by Fulham, and Hector Bellerin (£5.4m) has just ruptured his ACL. Yet the algorithm suggests that Cardiff are just poor enough in front of goal to help them up to five. Neil Warnock’s side failed to score against Huddersfield and Newcastle in the past two weeks and owners of Laurent Koscielny (£5.4m) will be optimistic that his goal and clean sheet against Chelsea can be followed up with more success on Tuesday. Sead Kolasinac (£4.9m) hasn’t scored this season but often assists from wing-back. In their hunt to chase down Liverpool, Man City see a trip to Newcastle as winnable. The Magpies scored three against Cardiff at the weekend but this was out-of-character for a team who regularly look toothless. That’s why Ederson (£5.6m), Kyle Walker (£6.4m) and Aymeric Laporte (£5.9m) form a triple-up in the optimum squad. The latter has started all but one of City’s league games this season, whilst Walker scored in September’s reverse fixture. After going eight games without a shut-out, the champions have re-found their defensive mojo and kept two in a row. Apart from a brief spell in the autumn, Brighton also haven’t been keeping clean sheets. They’ll see a trip to Fulham as a great opportunity to get back on track. Shane Duffy (£4.6m) is the league’s top-scoring defender with a remarkable four, so there’s plenty of logic behind his selection. What else is there to say about Salah? His form is phenomenal and his repertoire of goals is widening, with penalty duties, outside-of-the-boot flicks and on-the-line tap-ins recently added. There’s a gluttony of strong captaincy options this week, so it says a lot that Salah will certainly be the most-captained player once again. The fear of not doing so is too strong, regardless of Pierre-Emerick Aubameyang (£11.3m) hosting Cardiff, Marcus Rashford (£7.7m) taking on Burnley or Eden Hazard (£11.0m) facing Bournemouth. The algorithm is captaining Paul Pogba, considering his outstanding form since Ole Gunnar Solskjaer took charge and showed him some love. Said to be building his team around a reinvigorated Pogba, the interim boss has been rewarded with five goals and five assists in his six games. If his Uno game is anywhere near as good, train passengers will soon be in awe. Teammate Anthony Martial (£7.3m) is loved by the algorithm and makes another appearance, despite missing out on Manchester United’s party. He has started five of Solskjaer’s six games but only scored once alongside one assist and no bonus points. He might be worth sticking with though, taking into account his promising run of fixtures and the decline of similarly-priced options such as Richarlison (£6.8m), Bernardo Silva (£7.6m) and Felipe Anderson (£7.3m). At first glance, Aubameyang is the number one captaincy choice. The league’s second highest-scorer and top bonus-pointer faces newly-promoted Cardiff at home, a place where he has five goals from his last five games. Yet the forward has lost owners in recent weeks in order to accommodate Salah, not helped by three blanks from four games. However, patience should pay off seeing as Arsenal play three enticing home fixtures over the next five games. In a week where Kevin-Prince Boateng has signed for Barcelona, a place for Aleksandar Mitrovic (£6.5m) almost tops this for shockability. The Serbian striker has trolled FPL managers with one measly goal from ten games, although his goals do tend to come in winnable home games: two vs Burnley, two vs Southampton and the recent winner against Huddersfield. He may see Brighton’s trip to Craven Cottage in the same manner. Including Bernd Leno (£4.8m), John Stones (£5.2m) and Sokratis (£5.1m) in the back-up list is an extension of backing both Arsenal’s and Man City’s defences. With Stones comes a slight rotation risk but not playing at Huddersfield may indicate that it’s his turn to play again. Those managers in the enviable position of having spare transfers may go for David Button (£4.0m) as their second goalkeeper whilst Mat Ryan (£4.4m) is away at the Asian Cup. Duffy’s four goals are impressive but Lewis Dunk (£4.5m) also chips in occasionally, although he did score four own goals last season. Elsewhere, Tom Heaton (£4.8m), Ben Foster (£4.5m) and Neil Etheridge (£4.6m) are mostly included because of save points gained from anticipated onslaughts. Sterling and Leroy Sane (£9.7m) were overlooked this week because their defensive teammates have even better odds of delivering points, especially as Newcastle have only narrowly lost on their three post-promotion Man City meetings. Results of 0-1, 1-3 and 1-2 suggest a haul will be hard to collect for Man City, although Pep Guardiola’s side can turn it on whenever they please. As for Hazard, he hasn’t scored in four games and let many down when recently captained. If he plays, Alexandre Lacazette (£9.3m) could also enjoy facing Cardiff alongside Aubameyang. However, since Gameweek 13, he has only played more than 45 minutes on five occasions. In the same time frame, Rashford has risen from £6.7m to £7.7m and is now the game’s third most-owned player. He has stiffness in his knee but should be fine to play.